AP PRC 2015 Arrears Calculate Your PRC Arrears automatically by entering your 7 digit treasury ID only. PRC 2015 was sanctioned as per G.O.Ms.No.46 Dated: 30-04-2015 of Govt of AP with 43% Fitment.The Revised Scales of Pay will be implemented notionally from 01.07.2013 with monetary benefit from 02.06.2014. Cash was paid from April 2015. The benefit of the Revised Scales of Pay 2015 shall be paid in cash for month of April 2015 on wards. Separate orders will be issued detailing the modality for payment of arrears of salary in Revised Scales of Pay 2015 for the period from 02.06.2014 to 31.03.2015. Now the Govt of AP has decided to Pay the Arrears of PRC 2015 in installments. 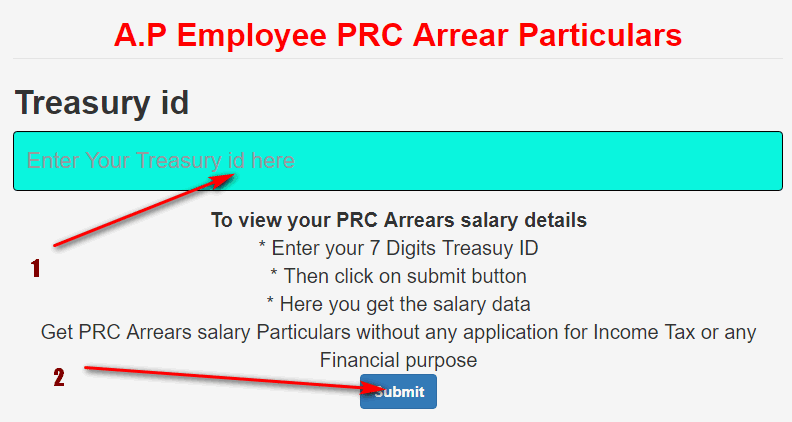 Here is the Calculator / Online Software to Calculate How much PRC Arrears is due in AP PRC 2015. Enter your 7 digit old Treasury ID number in given below EBADI.IN Website link . Then your PRC Arrears Table is generated automatically . And Generate PDF File option is available in that our EBADI Web page.